Staxton maintained their flawless start to the Readers Scarborough Beckett League Premier Division season with a four-wicket home win against Ebberston. Ben Lealman (45) and Adam Machen (26) were the only Ebberston batsmen to impress as they were dismissed for 131, Ryan Hargreaves the star Staxton bowler with an outstanding 5-12. Chris Dove hit 39, Jodie Robson added 29 and Aussie ace Rohan Diamond 27 as the hosts made their way to victory from only 20.4 overs, despite fine efforts from Tom Holmes (3-25) and Frankie Beal (3-58). Forge Valley remain second after a five-wicket home triumph against Filey, who dropped to fourth after this result. Nasar Khan grabbed a magnificent seven wickets for only 12 runs as Filey slipped to 101 all out, David Brannan top-scoring with 29. Tom Brough's 51 then guided Valley to victory. Staithes returned to winning ways with a rapid win at home to Cloughton by 10 wickets. The visitors limped to 52 all out from 30.2 overs, only Jon King (12) making it to double figures, Tom Steyert bagging 3-12 with Chris Morrison (2-4) and Andrew Theaker (2-5) also chipping in. Stuart Pearson smashed an unbeaten 38 as the hosts romped to their target from only eight overs. Rain halted play in the other three games in the top flight. Cayton were 78-4 when the elements halted their home game against Heslerton, Rich Bentley having taken three wickets for the latter, while Nawton Grange were 152-4 in their game at Settrington, Phil Marwood having hit 69 and Tom Garbutt 40. Craig Baker's 66 had helped Seamer limp to 113-7 from 42 overs at home to Scalby, James Deaves taking 3-10, the visitors were 1-1 from one over when play was halted. 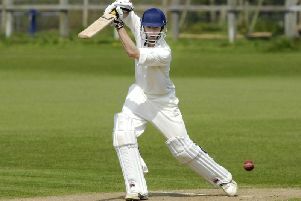 Brompton moved up to second in the Division One table after a 100-run home win against Great Habton. Phil Holden hit 48 not out and Pete Webster 33 as the hosts posted 172-7, then Mark Bruce took 4-19 and Tom Pateman 3-18 as Habton slumped to 72 all out. Thornton Dale must have been cursing the rain as they were 159-2 from 33.1 overs in their home game against Flixton 2nds when the elements wiped out the action. Tom Sigsworth hit an unbeaten 73 for Dale, with help from Andy Hill (30) and Tim Hunt (26no). Sherburn were all out for 157 in their game at Mulgrave, the hosts scoring 4-0 when rain stopped play. Phil Pickard (47), Jack Pickard (36) and Dan Simpson (31) shone for Sherburn, Mark Jackson taking 4-35. Wold Newton were 81-2 when rain stopped their home clash with Staxton 2nds, while there was no play possible between Wykeham and Bridlington 2nds.